‘Twas three days after Christmas and Alistair Overeem’s opponent for “Dream Dynamite!! 2010” still hasn’t been announced. Regardless, it didn’t stop HDNet from confirming his participation in the highly anticipated event. The high-definition network will broadcast the extravaganza live in North America on December 31st beginning at 4AM ET/1AM PT. This year’s show features more than 15 fights, including a “special rules” match between MMA superstar Shinya Aoki and K-1 striker Jienotsu Nagashima. The Japanese icons will alternate between MMA and K-1 rules during their matchup. 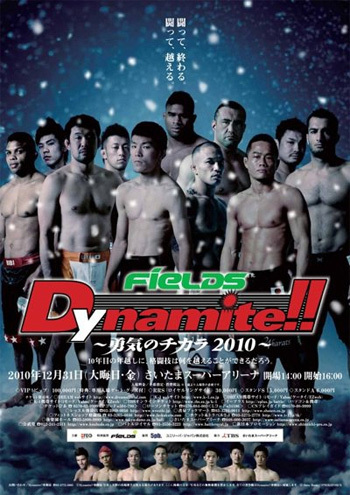 Established in 2002 as a joint promotion between K-1 and PrideFC, the annual “Dynamite! !” New Year’s Eve show has attracted a cumulative live audience of over 400,000 spectators. The 2009 festival attracted 45,606 to the Saitama Super Arena, which will also play host this year’s edition.